Men can have friends, statesmen cannot. 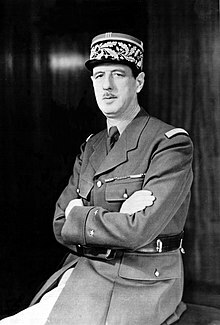 Charles-André-Joseph-Marie de Gaulle (22 November 1890 – 9 November 1970), in France commonly referred to as le général de Gaulle, was a French military leader and statesman. During World War II, he reached the rank of Brigade General and then became the leader of the Forces Françaises Libres ("FFL" — the "Free French Forces"). Between 1944 and 1946, following the liberation of France from German occupation, he was head of the French provisional government. Called to form a government in 1958, he inspired a new constitution and was the Fifth Republic's first president, serving from 1958 to 1969. All my life I have had a certain idea of France. Opening sentence of his Mémoires de guerre. Said before the population of Algiers after they had called upon him to take power, June 4, 1958. Said in 1967 on the balcony of Montréal City Hall. It caused a diplomatic uproar with Canada and inflamed the Quebec sovereignty movement. France has no friends, only interests. Clementine Churchill: "General, you must not hate your friends more than you hate your enemies"
De Gaulle (in English): "France has no friends, only interests." (De Gaulle did not speak specifically of France, but of all nation-states, including Britain. This remark was in line with his saying "Men can have friends, statesmen cannot",*Les hommes peuvent avoir des amis, pas les hommes d'Etat., in Interview, December 9, 1967). 23 November 1959, Strasbourg. The phrase shown in bold is the most often quoted excerpt. De Gaulle was expressing his vision of Europe's future. Now she is like everyone else. Maintenant, elle est comme les autres. When we were children, we often played war. We had a fine collection of lead soldiers. My brothers would take different countries: Xavier had Italy; Pierre, Germany. Or they would swap around. Well, I, gentlemen, always had France. Poster À tous les Français (To All Frenchmen), August 1940. À tous les Français was designed and displayed in London to accompany the Appel du 18 juin (Appeal of 18 June) following defeat at the Battle of France. The pair are considered to be the founding texts of the Résistance. At the root of our civilization, there is the freedom of each person of thought, of belief, of opinion, of work, of leisure. "Do you know that you have caused us more trouble than all the rest of our European allies?" "I do not doubt it. France is a great power." Conversation with Anthony Eden, recounted in de Gaulle's Mémoires de guerre. Quoted in The Atlantic, November 1960. It is unnecessary, for the Republic has never ceased to exist. I was the Republic. Reply in August 1944 to a statement of regret that the windows of the Hotel de Ville in Paris were not opened for the crowd outside cheering the reestablishment of the Republic. Quoted in The Atlantic, November 1960. I am retiring. I have a mission, and it is coming to an end … France may still one day need an image that is pure. She must be left this image. If Joan of Arc had married, she would no longer have been Joan of Arc. "A foreign military leader whose daring was feared by those who profited by it." De Gaulle said that MacArthur's critics should "pay deserved tribute to the legendary service of a great soldier". from William Manchester's "American Caesar". I am a man who belongs to no-one and who belongs to everyone. Why do you think that at 67 I would start a career as a dictator ? Pourquoi voulez-vous qu'à 67 ans je commence une carrière de dictateur ? Press conference, May 19 1958 (De Gaulle was changing the constitution to make government more efficient, after decades of impotent parliamentary regime, and he mocked journalists who claimed he was establishing a dictatorship). No policy is worth anything outside of reality. Il n'y a pas de politique qui vaille en dehors des réalités. How can you govern a country that has two hundred and forty-six varieties of cheese? Comment voulez-vous gouverner un pays qui a deux cent quarante-six variétés de fromage? So, it is true that one’s homeland is entirely human, emotional and that it is the root of action, of authority, of responsibility from which one can build Europe. What elements? Well, [nation] States, because only States are valid, are legitimate, in this respect, in addition they are capable of… As I have already said and I repeat, that at the present time, there cannot be any other Europe than that of the States, apart of course from myths, fictions, parades. From this solidarity depends all hope of uniting Europe in the political field and in the field of defense, as in the economic field. From this solidarity depends, therefore, the destiny of Europe as a whole, from the Atlantic to the Urals. Alors, il est vrai que la Patrie est un élément humain, sentimental et que c’est sur des éléments d’action, d’autorité, de responsabilité qu’on peut construire l’Europe. Quels éléments? Eh bien, les États, car il n’y a que les États qui, à cet égard, soient valables, soient légitimes et en outre soient capables de réaliser… J’ai déjà dit et je répète, qu’à l’heure qu’il est, il ne peut pas y avoir d’autre Europe possible que celle des États, en dehors naturellement des mythes, des fictions, des parades. De cette solidarité dépend tout espoir d’unir l’Europe dans le domaine politique et dans le domaine de la défense, comme dans le domaine économique. De cette solidarité dépend, par conséquent, le destin de l’Europe tout entière, depuis l’Atlantique jusqu’à l’Oural. I am not ill. But do not worry, one day, I will certainly die. Of course one can jump up and down yelling Europe ! Europe ! Europe ! But it amounts to nothing and it means nothing. Bien entendu, on peut sauter sur sa chaise comme un cabri en disant l’Europe ! l’Europe ! l’Europe ! mais cela n’aboutit à rien et cela ne signifie rien. Long live Montreal, Long live Quebec! Long live Free Quebec! Vive Montreal; Vive le Québec! Vive le Québec libre! From a balcony at Montreal City Hall, with particular emphasis on the word 'libre'. The phrase, a slogan used by Quebecers who favoured Quebec sovereignty, and de Gaulle's use of it, was seen by them as lending his tacit support to the movement. The speech sparked a diplomatic incident with Canada's government, and was condemned by Prime Minister Lester B. Pearson, saying that "Canadians do not need to be liberated." Within ten years, we shall have the means to kill 80 million Russians. I truly believe that one does not light-heartedly attack people who are able to kill 80 million Russians, even if one can kill 800 million French, that is if there were 800 million French. Discussing the Force de Frappe. Quoted in The New York Review of Books, 29 April 2010. The sword is the axis of the world and grandeur cannot be divided. in Vers l’armée de métier. Nothing great is done without great men, and they are great because they wanted it. France was built with swords. The fleur-de-lis, symbol of national unity, is only the image of a spear with three pikes. in La France et son armée. The desire of privilege and the taste of equality are the dominant and contradictory passions of the French of all times. in Le Fil de l'épée. in Le Fil de l’épée. Character is the virtue of hard times. Difficulty attracts a man of character, for it is by embracing it that he fulfils himself. General de Gaulle was the de facto leader of the Free French Forces which had escaped to London in World War II. Marshal Henri Philippe Pétain, a hero of world War I, had signed an armistice (agreement to end fighting) with the invading forces of Nazi Germany, and led the Nazi-collaborating government of Vichy France in the south. The Nazis had occupied the north of France. De Gaulle was opposed to surrender and had left France on June 15, 1940 after Pétain made clear he wanted to do so. Three days later, de Gaulle obtained special permission from Winston Churchill to broadcast a speech via BBC Radio over France, despite the British Cabinet's efforts to block the broadcast. In the speech, de Gaulle reminded the French people that the British Empire and the United States of America would support them in an effort to retake their land from the Nazis. On June 18, 1940, at 19:00, de Gaulle's voice was broadcast nationwide. "The leaders who, for many years, were at the head of French armies, have formed a government. This government, alleging our armies to be undone, agreed with the enemy to stop fighting. Of course, we were subdued by the mechanical, ground and air forces of the enemy. Infinitely more than their number, it was the tanks, the airplanes, the tactics of the Germans which made us retreat. It was the tanks, the airplanes, the tactics of the Germans that surprised our leaders to the point to bring them there where they are today. "Believe me, I speak to you with full knowledge of the facts and tell you that nothing is lost for France. The same means that overcame us can bring us to a day of victory. For France is not alone! She is not alone! She is not alone! She has a vast Empire behind her. She can align with the British Empire that holds the sea and continues the fight. She can, like England, use without limit the immense industry of United States. "This war is not limited to the unfortunate territory of our country. This war is not finished by the battle of France. This war is a world-wide war. All the faults, all the delays, all the suffering, do not prevent there to be, in the world, all the necessary means to one day crush our enemies. Vanquished today by mechanical force, we will be able to overcome in the future by a superior mechanical force. "The destiny of the world is here. I, General de Gaulle, currently in London, invite the officers and the French soldiers who are located in British territory or who would come there, with their weapons or without their weapons, I invite the engineers and the special workers of armament industries who are located in British territory or who would come there, to put themselves in contact with me. "Whatever happens, the flame of the French resistance must not be extinguished and will not be extinguished. Tomorrow, as today, I will speak on Radio London." Jews remain what they have been at all times: an elite people, self-confident and domineering. I am Joan of Arc. I am Clemenceau. The evolution toward Communism is inevitable. Reported in the National Review (November 1962) as a misattribution created by extreme rightists. See Paul F. Boller, John George, They Never Said It: A Book of Fake Quotes, Misquotes, and Misleading Attributions (1990), p. 33. Leahy also watched with dismay as General de Gaulle's militant supporters eclipsed the leaders Leahy believed had the real interests of France at heart. De Gaulle, who had now taken the Cross of Lorraine as his personal symbol, was too ruthless to fail. Leahy was by no means ready to accept the tall, vainglorious Frenchman as the natural leader of French interests. In common with most of his staff who had been with him in Vichy, he distrusted de Gaulle and his French Committee of National Liberation (FCNL). As early as the previous September, Leahy had expressed his views to friends in the State Department, and "Doc" Matthews had sent him a collection of letters and reports from Murphy and others naming chapter and verse of how de Gaulle and his followers had consistently undercut Giraud. Leahy had no particular brief for Giraud, but he was the one recognized by the British and Americans as French military leader in the Mediterranean. For the same reason de Gaulle had been kept in the dark before Torch- because his headquarters could not keep a secret- Giraud concealed from the FCNL his invasion of Corsica in September until just before the landings. De Gaulle's response was to use the FCNL, which he now dominated, to deprive "the French Commander-in-Chief of the authority and freedom of action which both he and our own military leaders have felt was essential. Such behavior, Leahy felt, was all of a piece with what was to be expected from Charles de Gaulle and his Free French. There was no living with de Gaulle, but because of decisions made by Churchill and FDR, Leahy had to try. Looks like a king in exile. During his stay in London King was presented to King George VI at Buckingham Palace. His Majesty, wearing the uniform of an admiral of the fleet, received King in a sitting room where he was at work on papers. Whiskey or tea was offered, and as King had given up spirits for the duration of the war, he gladly accepted the tea, which was ready. The King reminisced agreeably about his cruises in the Royal Navy, and asked the admiral about his own with such tact that the audience, in retrospect, resembled a chat between a couple of old sailors. None of this comfortable atmosphere prevailed when General de Gaulle called at Claridge's to pay his respects to King and Marshall. Stark, who throughout the war skillfully conducted many negotiations with the Free French, had arranged the meeting. De Gaulle, feeling himself to the the head of a state, seemingly considered that he should be called upon, but as it had been pointed out that he had two stars, while Marshall and King had four, he presented himself at Claridge's, although with rather ill grace. He appeared at the proper time with a single aide, but conducted himself very stiffly, and after delivering himself of a long speech in French, in which he asked for many things that we needed ourselves at that moment, took his departure. It was scarcely a call calculated to make friends! In the course of the Casablanca Conference, General de Gaulle, who was in London, had been invited by the Prime Minister to come to North Africa. De Gaulle was offended that he had not been invited further in advance, and in one way and another proved to be his usual difficult self. Mr. Eden, the Foreign Secretary, had to exert great pressure to induce him to leave London for Casablanca. When he arrived there the firmest treatment by Mr. Churchill was required to persuade him to call upon Giraud. Finally in the interests of at least good public feeling a "shot-gun marriage" was arranged. At a press conference on 24 January, De Gaulle and Giraud were made to sit in a row of chairs, alternating with Mr. Roosevelt and Mr. Churchill, and to be photographed shaking hands. As the newsreel cameras finished their work, each French general dropped the other's hand as though it were red hot. Prior to the landings De Gaulle had made it clear that he wished to be definitely recognized as the ruler of France, and claimed that he alone had the right to give orders to the people of France. Once the landings had taken place these difficulties did not diminish, and the Joint Chiefs during their stay in England had a taste of these complications when De Gaulle undertook to change the regulations about the use of United States currency in France by American troops. The Joint Chiefs sent General Koenig, who, as the commander of the French forces of the interior, was serving as a direct subordinate of Eisenhower's in the Allied organization, and asked him what the difficulty was. It appeared that Koenig could not see De Gaulle's point either. As Eisenhower was troubled about the correct manner of managing civilian affairs in France until a proper organization could be set up, he asked the Joint Chiefs what to do, and they proposed that he at once send a message to the President, suggesting that if De Gaulle would not cooperate properly, another Frenchman be designated to manage French civilian affairs, and that De Gaulle be ignored, entirely. The Joint Chiefs did not stay to hear the answer from the President, but later that evening they received word that he had concurred. Present at Casablanca but excluded from every talk that mattered was Charles de Gaulle. No one seemed to know quite what to do with him. But before the conference was over, his differences with the Allies had been patched up somewhat, and his future role had been much clarified.